French physician and translator; born at Marseilles 1294. He devoted himself early in life to the study of science, especially philosophy. When he was about eighteen years old he went to Salon, where he studied astronomy under the guidance of Sen Astruc de Noves. 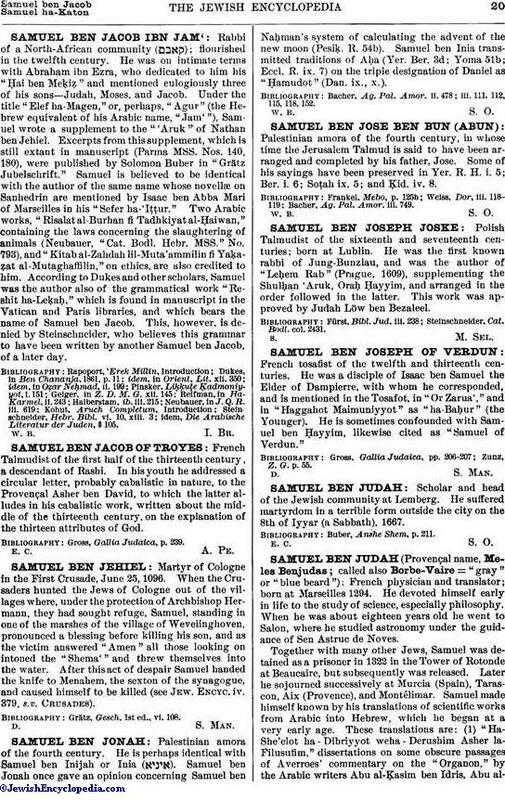 Together with many other Jews, Samuel was detained as a prisoner in 1322 in the Tower of Rotonde at Beaucaire, but subsequently was released. Later he sojourned successively at Murcia (Spain), Tarascon, Aix (Provence), and Montélimar. 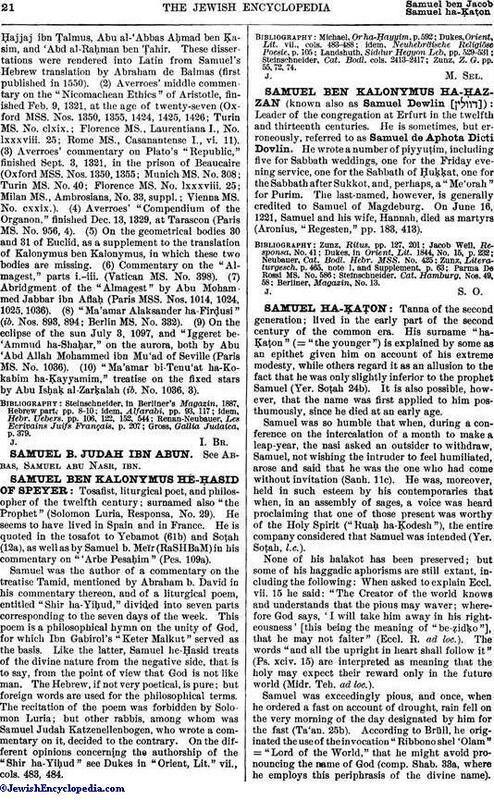 Samuel made himself known by his translations of scientific works from Arabic into Hebrew, which he began at a very early age. These translations are: (1) "Ha-She'elot ha - Dibriyyot weha - Derushim Asher la-Filusufim," dissertations on some obscure passages of Averroes' commentary on the "Organon," by the Arabic writers Abu al-Ḳasim ben Idris, Abu al-Ḥajjaj ibn Ṭalmus, Abu al-'Abbas Aḥmad ben Ḳasim, and 'Abd al-Raḥman ben Ṭahir. These dissertations were rendered into Latin from Samuel's Hebrew translation by Abraham de Balmas (first published in 1550). (2) Averroes' middle commentary on the "Nicomachean Ethics" of Aristotle, finished Feb. 9, 1321, at the age of twenty-seven (Oxford MSS. Nos. 1350, 1355, 1424, 1425, 1426; Turin MS. No. clxix. ; Florence MS., Laurentiana I., No. lxxxviii. 25; Rome MS., Casanantense I., vi. 11). (3) Averroes' commentary on Plato's "Republic," finished Sept. 3, 1321, in the prison of Beaucaire (Oxford MSS. Nos. 1350, 1355; Munich MS. No. 308; Turin MS. No. 40; Florence MS. No. lxxxviii. 25; Milan MS., Ambrosiana, No. 33, suppl. ; Vienna MS. No. cxxix.). (4) Averroes' "Compendium of the Organon," finished Dec. 13, 1329, at Tarascon (Paris MS. No. 956, 4). (5) On the geometrical bodies 30 and 31 of Euclid, as a supplement to the translation of Kalonymus ben Kalonymus, in which these two bodies are missing. (6) Commentary on the "Almagest," parts i.-iii. (Vatican MS. No. 398). (7) Abridgment of the "Almagest" by Abu Mohammed Jabbar ibn Aflaḥ (Paris MSS. Nos. 1014, 1024, 1025, 1036). (8) "Ma'amar Alaksander ha-Firḍusi" (ib. Nos. 893, 894; Berlin MS. No. 332). (9) On the eclipse of the sun July 3, 1097, and "Iggeret be-'Ammud ha-Shaḥar," on the aurora, both by Abu 'Abd Allah Mohammed ibn Mu'ad of Seville (Paris MS. No. 1036). (10) "Ma'amar bi-Tenu'at ha-Kokabim ha-Ḳayyamim," treatise on the fixed stars by Abu Isḥaḳ al-Zarḳalah (ib. No. 1036, 3). Gross, Gallia Judaica, p. 379.